Qinu interacts with one of her trainers. Qinu receives a routine ultrasound from one of Georgia Aquarium’s veterinarians. In the coming months, a new addition will arrive at Georgia Aquarium. One of the Aquarium’s beluga whales, Qinu (KEY-new), is expecting. This is her first pregnancy and her calf is due in the late fall. Although the calf’s gender will not be known until after birth, beluga whales have hefty offspring weighing anywhere from 110-175 pounds at the time of birth and their gestation period is 14-15 months. Animal care teams noticed Qinu and Aurek (Oar-RICK), one of the Aquarium’s male beluga whales, spending more time together, leading to suspicions of her pregnancy. The veterinary and animal care teams work together on a daily basis to not only ensure the very best care, but to monitor the health of animals as they grow during every phase of life. They were able to confirm Qinu’s pregnancy with a routine ultrasound. Ultrasounds are not only used for pregnancies, but to also monitor internal organs and other elements in many of the animals at the Aquarium. Her care teams are monitoring the calf’s growth through ultrasound imagery. Over the next several months, Qinu will receive the same expert care – with a few adjustments. She will continue to receive routine ultrasounds, veterinary exams, and more helpings of her favorite fish as her appetite grows. Qinu is also part of an important research study that will compare data from beluga whales in human care to those in the wild and help scientists better understand this species during pregnancy. 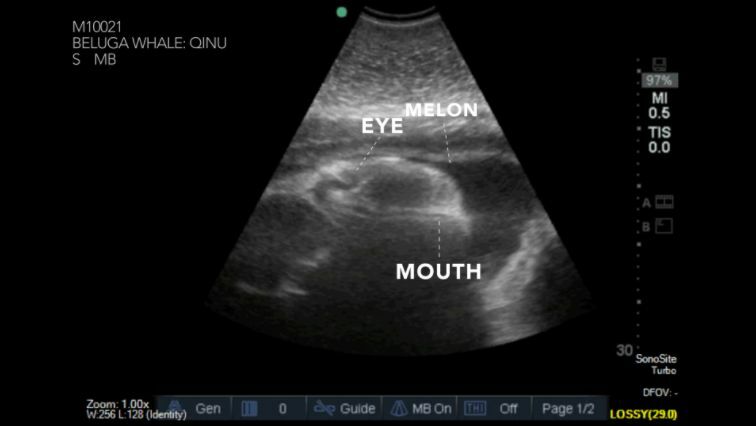 An ultrasound image of Qinu’s calf. As Qinu and her animal care teams prepare for the delivery of her calf this fall, stay tuned for updates along the way by following Georgia Aquarium on Facebook, Twitter, and Instagram and by visiting news.georgiaaquarium.org.